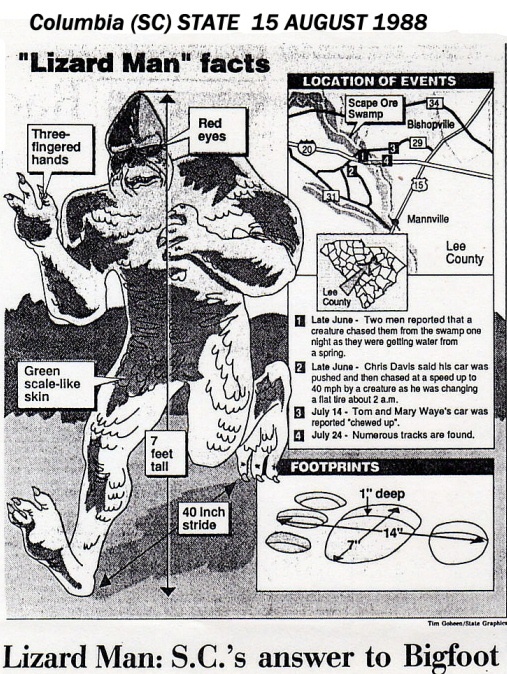 September 3, 1988 -- Lee County, South Carolina -- The 17-year-old youth who created an international Lizard Man frenzy has passed a private polygraph test about his encounter with the 7-foot creature, his promoters say. Polygraph experts say that means Davis believes he saw what he said he saw -- a red-eyed greenish creature that chased him on a rural county road. Others put as much stock in polygraphs as they do Lizard Men. Lee County Sheriff Liston Truesdale said another "eyewitness" claims in a sworn statement to have crossed paths with the creature last fall. Yet another man reported seeing a "brownish creature about 8 feet tall" eight days ago. Truesdale's office investigated, and the sheriff said he will administer a polygraph test to the man, a colonel living in Lee County, next week. "Everyone who reports seeing something will be given a polygraph test," Truesdale said. Sumter Police Capt. Earl Berry administered Davis' polygraph Aug. 18 at the Sumter City-County Law Enforcement Center. The test was paid for by Southern Marketing Inc., a company formed by two Sumter men to arrange personal appearances for Davis, and Berry said he could not release the results. Davis said his father wanted him to undergo the exam "to prove I'm telling the truth." Rick Welch, a former Sumter police detective and a partner with Randy Galloway in Southern Marketing, said he and Galloway arranged to have the test done "to satisfy our minds. Some in the media are saying he might be on drugs or strung out on drugs." " What put the icing on the cake was one weekend we had some young boys picking on him, so we wanted to set the record straight." Welch said the questions Davis correctly answered included: "Was the creature that attacked your car green and black? Were you drinking or smoking drugs? Were you really driving 35 mph when a creature jumped on your car? Did it occur immediately following your changing a flat tire?" While police rely on polygraph exams as an investigative tool -- often eliciting a confession -- results are rarely allowed in court because of contentions that polygraph testing is not an exact science. "We've long been opposed to them because of their unreliability and invasiveness. They're probably as reliable as the Lizard Man story itself," said Charles Taylor, director of the Carolina Alliance for Fair Employment. About 10 percent of those undergoing polygraph exams -- including people who suffer from mental illnesses like psychosis, schizophrenia or paranoia -- would not be good polygraph subjects and probably would provide inconclusive results, veteran examiner Frank Faulk said. "If a person really believes he didn't commit a crime or was so drunk he doesn't remember it, he could possibly pass it," said Faulk, who retired in 1978 after 27 years as the State Law Enforcement Division's chief polygraph examiner. Truesdale said he had been looking for another Browntown resident who told a deputy in June he saw a creature in the swamp last fall. The deputy didn't put much stock in the story until Davis made his claim. "What adds credibility to his story is that we knew about him before we knew about Chris Davis," the sheriff said. "We've been looking for him but couldn't find him." In an Aug. 13 statement, George Holloman Jr., a 31-year-old construction worker, said he had ridden a bike to a flowing spring about 12:30 a.m. one day last fall. Holloman drank some water, lit a cigarette, turned around and "saw it across the road," Truesdale said. "What he saw, he thought, was a dead tree that had been struck by lightning. Then it moved." The sheriff said Holloman described it as between 7 and 8 feet tall, and it "stood up like a man," Truesdale said. "A car passed by, and that's when he saw the eyes. He said they glowed when the car passed." The creature went back in the swamp after the car passed, Holloman told the sheriff. "He thought it was a 'hant,' " what rural folks call ghosts, the sheriff said. Truesdale said Holloman told no one of the encounter. "When he did tell his family, his brother thought he was going fool."